A ferrofluid is a fluid that becomes highly magnetized in the presence of a magnetic field. Ferrofluids are colloidal suspensions made of nanoscale ferromagnetic particles suspended in a carrier fluid. A colloidal suspension can be defined as a material with characteristics of more than one state of matter. The particles are suspensions of larger, and usually non-stable, magnetic particles. “The ferrofluid actually contain tiny particles (~10 nm diameter) of a magnetic solid suspended in a liquid medium.” Ferrofluids were initially discovered in the 1960s at the NASA Research Center, where scientists were investigating different possible methods of controlling liquids in space. A distinguishing aspect of the research area in ferroﬂuids is the adequate applicability of the material. A substantial effort was made by chemists and physicists to synthesize stable magnetic ﬂuids and use them in various important and technological applications. Ferrofluids are actually used in audio speakers. Ferrofluid facilitates audio speakers to function more efficiently, in order to enhance audio response and ameliorate power handling. Ferrofluids eliminate heat from the voice coil, and passively damp the movement of the cone. Audio ferrofluids are based on two classes of carrier liquid: synthetic hydrocarbons and esters (an organic compound made by replacing the hydrogen of an acid by an alkyl or other organic group). Both the oils possess very low volatility and high thermal stability. The choice of fluid is dictated by the environmental considerations of the application combined with the best balance of magnetisation and viscosity. By varying the quantity of magnetic material in a ferrofluid, and by using different carrier liquids, it can be tailored to meet a variety of needs. The physical and chemical properties such as density and viscosity correspond closely to those of the carrier liquid. 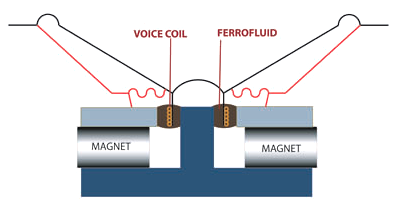 Audio ferrofluids have benefits such as: increased thermal power handling, reduced distortion, reduced coil / magnet size, and voice call centering. Ferrofluids are also used in the medical industry. Ferrofluids are used for treating ulcers and fistulas, malignant brain tumours, destroying cancer cells and also in helping to preserve vision. I find the application of ferrofluids to help preserve vision really intriguing. A magnetized ferrofluid is used to keep the eye’s retina in its place so that it stops laminating itself over conditions. The magnetic force acts like a piece of tack with which the eye will still be able to move. I thought of an application of ferrofluids that would indeed create a map or a track of ones movements and thought the way the ferrofluid would stain glass would be interesting. 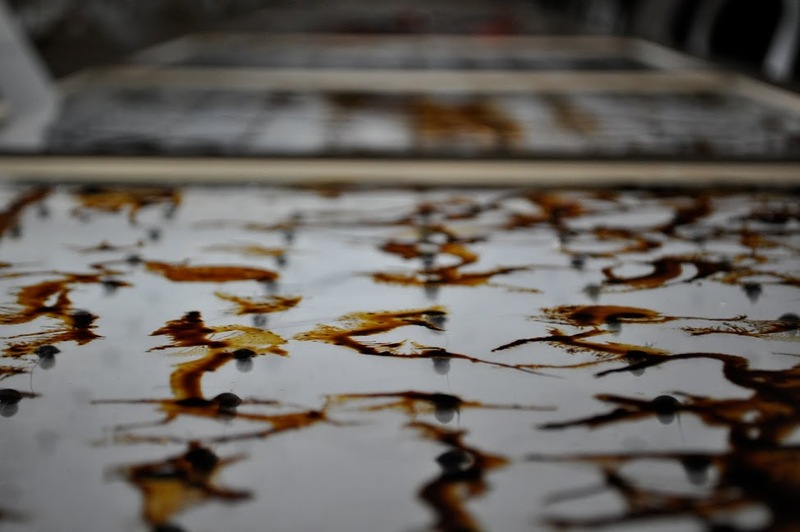 Example: a transparent glass panel with ferrofluid solution on the underside of it, and if one outlines something on the panel using a magnet, the ferrofluid would stain that glass panel showing the entire action, it is like a long exposure photograph. I then came across this Ferrofluid Table, which is indeed the same idea and very interesting.